Here’s a link to Newsarama’s review of Image Comics: The Road To Independence. This entry was posted in TNT on 27 August 2007 by Mr. Morrow. Really nice op-ed piece on Jack Kirby in yesterday’s New York Times. Check it out! But, we all got through it, and it’s actually one of the coolest schools we’ve ever encountered, with a lot of parent volunteers helping out (including Pam and me, who’ll soon be doing our part in the school cafeteria a couple of times each month). Pam’s already been recruited to design logos and brochures for the booster club as well, and as several people who have kids there have told us, our involvement with school activities is apparently only beginning. Next up: carpooling. I’ve got an ample supply of Kleenex ready. This entry was posted in TNT on 26 August 2007 by Mr. Morrow. Again, great job George, on both your book, and the Comicon panel! Just an aside: I used to get all my comics from Westfield back in college, and their customer service was always exemplary. Great company! All our newest books and mags are now officially in the mail, including the limited edition of the John Romita…And All That Jazz hardcover (52 copies, with custom Romita sketches in each; sorry folks, they sold out quickly). So if you’ve been patiently waiting while we get caught up on shipping after Comicon, look for your stuff in your mailbox soon. And thanks for hanging in there with us; we’ll be back to same-day and next-day shipping on orders by the end of this week. After a week of vacation, we’re back at TwoMorrows HQ, to a huge pile of orders and emails. So I’ll have to ask everyone’s patience, as we slowly dig out of the rubble. We hope to have everything caught up by week’s end, including shipping of all our new publications that were released over the last two weeks while we were gone. 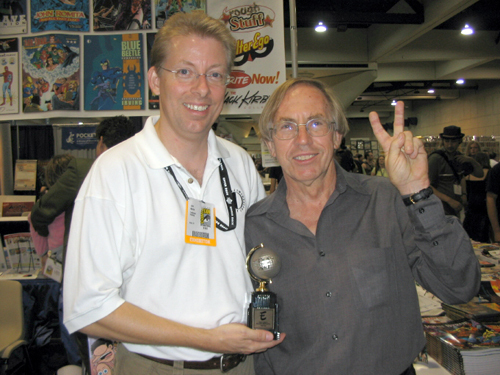 In the meantime, enjoy this photo of Roy Thomas and your’s truly, basking in the afterglow of Alter Ego’s Eisner Award for “Best Comics Related Periodical”, at our Comicon booth. Photo by Dann Thomas. This entry was posted in TNT on 6 August 2007 by Mr. Morrow.